George Emerson has finally bowed to the pressure to retire as a High School English teacher. He didn't have to but the budget cuts had him being encouraged to do so. And then the attitude of most of his students was less than encouraging. But now retirement is stretching out before him. George has always been a very set in his ways conservatively dressed person. He has few friends and no family, all in all, a very lonely person, at least that is Willow West's impression of him when she comes seeking a recommendation letter for her soon to graduate grandson. Collin is a very serious and conscientious student and George is more than happy to provide him with the letter his grandmother requested. And when His grandmother asks that he attend a graduation party for Collin, George reluctantly agrees though social gatherings are not his thing. Willow sees it as her mission to help George Emerson loosen up as he enters retirement. And when he goes from Mr. Emerson to George she sees that as a huge step in the right direction. Now if she can get him to dress casually when attending social events it will be a great victory. George is in a quandary where Willow is concerned sometimes he feels drawn to her and at other times she annoys him to no end especially when she pushes her way into his life and day with suggestions on improving what he doesn't feel needs change. George has no interest in adding people into his life. He's had others in his life - friends, family, and pets - and lost them all. To his way of thinking, God either doesn't exist or God hates him. After all, everyone else must have been good enough for God if he is to believe what his Grandmother told him but he wasn't good enough for God to want him. But Willow sees it differently - if only she can get George to see it too. 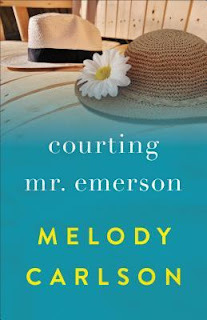 Courting Mr. Emerson is an interesting book. Some moments I really enjoyed it and others I was a bit Georgish in my feelings towards the story. But overall it was an enjoyable read though at times I may have felt like slamming the door in Willow's face if I'd been George (not that I would have, but she probably would not have made it past the front door). Willow seems like a caring person just a bit too caring if you don't like feeling closed in. As I said I'm more of a George than a Willow personality type so I can sympathize with his feelings at times. And a word of warning: don't plan a hot air balloon trip as a surprise. When fun-loving artist Willow West meets buttoned-up George Emerson, it's not exactly love at first sight. More like an intriguing project at first sight. Willow makes it her mission to get the obsessive-compulsive, newly retired English teacher to loosen up and embrace life, but even she has to admit it seems like a lost cause.